So remember all those times I complained about my bum shoulder? Well, as it turns out, I had a fairly good reason to be doing so. 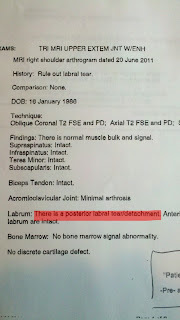 After over a decade of simply whining and trying to deal, I went to Triangle Orthopedic on Monday for an arthrogram and MRI, and I just got the results back yesterday. Two days ago I wouldn't have been able to tell you anything about the labrum, and now I know exactly where it is, what it's supposed to do, and how mine is not doing what it should. 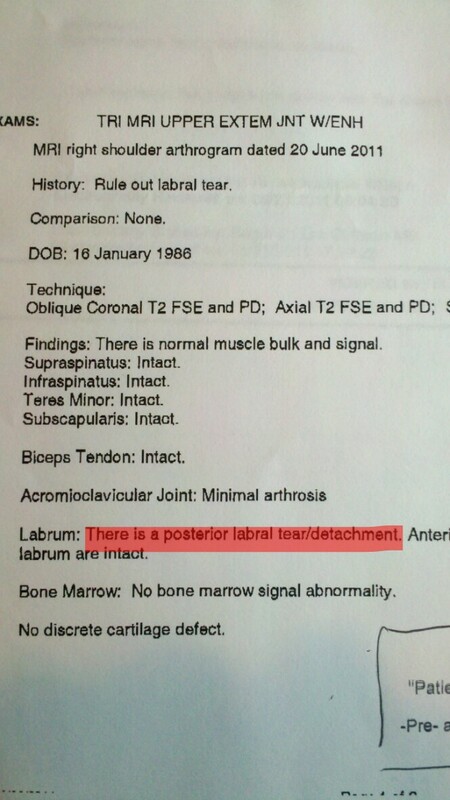 Here's a drawing of a labral tear. Mine is in the back of the shoulder, and there's also a chance that the tendons in the front are overly loose(possibly contributing to or as a result of the injury), which won't be known for sure until they go in there, but will be an easy-ish fix if that is the case. The doc told me that there's basically two options. Number one is basically just keep doing what I have for the past decade and a half - there's nothing included in conventional injury-specific physical therapy that I haven't already tried. I've done stretching and strengthening of all kinds, periods of immobilisation, chiropractic adjustment, and on and on. And I can still never tell you if today will be the day that I'll be doing a pull-up, or shifting the baby from one hip to the other, or even taking off my shirt and suddenly the joint will slip and I'll gasp in sudden, intense pain and probably drop whatever I'm holding. Note that I have dropped myself off the pull-up bar before but I have never, ever dropped a baby, and I never plan to. And...option number two is surgery. Apparently the surgery itself is nothing to worry about. There wouldn't be any metal pins or the like inside me - the only foreign substances would be sutures and this polymer stuff that would eventually melt and be replaced by my bone. I wouldn't even have to stay in the hospital overnight. But I'm still scared as hell for everything that comes afterwards: according to my awesome doc (Dr. Silver at Triangle Orthopedics, if anyone's looking for a nice dude to fix what ails ya, joint-wise), it would be a month with my arm in a sling to start. Then 2-3 months relearning how to do everyday things - driving springs to mind. And THEN it would be a good 6-8 months (I was unsure and forgot to ask if this was cumulative or not) before I could think about doing any kind of lifting or semi-serious upper body exercise again. Read: no CrossFit. So this is why I'm most scared. Assuming the worst, that each of those specified times are on their own, not cumulative, that adds up to a full year of not being able to lift or do CrossFit. The reason this scares me so much is that before I started any of this, I was fat and sad and had no direction whatsoever in my life. Each one of those things has been reversed as a direct result of doing this stuff. So I'm terrified that without the ability to keep doing it, I'll change course again and head inevitably back to where I started, which was not a fun place to be at all. I know I really need to get this done, and it's really not that big a deal, considering what some people go through. I'm just worried and scared (I've never been put under before, another point of stress) and bleargh. People who have had operations that require a lot of recovery time (especially athletes/CrossFitters): how do you cope? I'd really like to know. Here's Pendlay's boy squatting with a severely messed up wrist. Just because your arm's in a sling doesn't mean you can't do work. you really should talk with allison b. she's had at least 3 surgeries on her shoulder. the good news is once you've been given the clearance, you will be able to 1 arm stuff in crossfit. you won't have to completely give up every aspect about it. allison is currently 1 arming it. Focus on what you CAN do. The good news for you is that you still have full use of your legs, hips, and glutes. That's where the athlete is. I had to give up PK training for 5 months last year. It sucked until I realized there was plenty to work on. So I got a one-armed chinup, improved my levers, and spent a lot of time on balance and posture. I learned a TON. Now, I'm better than ever. This obstacle, like all obstacles, is actually an opportunity. You now have 8 months to perfect your squats. Or your barefooting. Or your precision jumping. Or or or... there's a world of possibilities out there. This is an investment in your future fitness. Like all investments, there's an up-front cost. But the return you'll get will be enormous. The NPV is huge. You guys are awesome. Any non-CFD-ers reading this: the above commenters are all coaches at my gym. That's how cool we are. Phil: I'm making a "stop whining already" playlist of inspirational videos. That's gonna be first. Ashley: I'm trying to track her down. And now that I've (mostly) stopped whining to myself, I'm thinking about how I can adapt. Maybe squats with a weight vest, or sandbag on the other shoulder? Colin: I like how you think. The athlete is TOTALLY in my glutes. Right there.